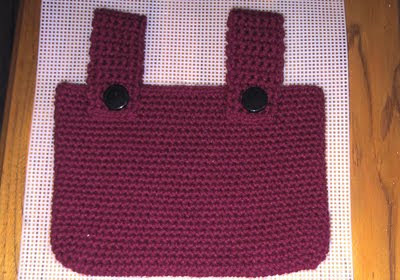 There are three options for the tote portion of the Walker Totes. Also three options for the straps. Count them, that makes 9 possible combinations. My personal goal is to make 50 of them before this Christmas. 3. When working rounds with joins, make the first stitch in the same stitch as join. From now on join the rounds. When joining pull the slipstitch tight, this will minimize the joins. See the strap options below. You need an odd number of stitches for the next rounds, you will be working hdc in the sc and sc in the hdc of the prior round. Slipstitch (don’t pull these slipstitches tight) in next few sts until there are 5 unused sts to the fold. Row 24: (buttonhole round) Ch 1, turn. Sc in 2 sts, ch 2, skip 2 sts, sc in 2 sts. (6 sts). Row 25: Ch 1, turn. Sc in 2 sts, sc in 2 chs, sc in 2 sts. (6 sc). Row 26: Ch 1, turn. Sc across. (6 sc). Row 24: (buttonhole round) Ch 1, turn. Sc in 2 sts, ch 2, skip 2 sts, sc in 2 sts. (6 sc). Sew buttons on opposite side of tote to correspond to the buttonholes. Work tote through round 27. Rows 2-26: Ch 1, turn. Sc across. (6 sc). Sew Velcro to end of strap and on opposite side of caddy to correspond. Row 10: Ch 1, turn. Sc across. (6 sc). 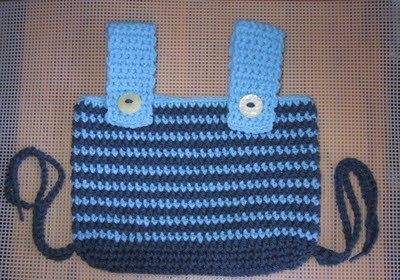 Lay tote flat with tabs on the bottom, place a marker in the top side (side without tabs) at the first left stitch of both tabs. There should be 15 sts between the markers. As a nurse that works with the "geriatric" crew - they will love these for their walkers! I'm definitely making these for gifts for the residents I used to work with! Thank you so much!!! These are pretty cool. 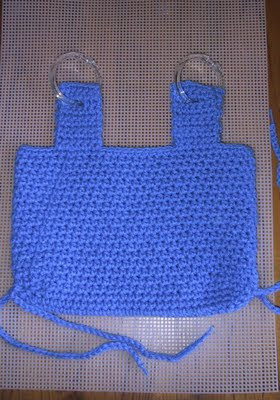 Betcha they could be used as "stroller totes" too for those smaller baby strollers. I've got a couple of cousins who absolutely loathe full diaper bags on thier morning/afternoon walks. The dimensions of the tote are big enough that it would accomodate what they'd need for a half an hour or so walk. Hunh. I really *like* your idea! Way cool and neat! Good idea Dici. I hadn't thought of that. Thanks, Suzie! I love your stuff but this is the best I've seen in quite some time. Living in a senior community, there are more than one on a walker and these totes will make excellent gifts. 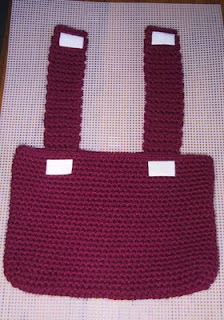 I made a smaller version of the walker tote for a friend of a friend in a wheelchair. She uses it to put her phone and other small things in. Thanks for the great pattern.